It has been a busy weekend, Saturday was spent rushing around trying to organise Ebi-kuns outfit for the 7-5-3 festival, grocery shopping and going to football club and all day yesterday we were at the Montessori farm. When we got there, the first thing the boys did was to go and hunt for bugs then they harvested some veggies for lunch, turnip, daikon (giant white radish) and spinach, they were quite excited to see how it had grown since last month. One of the good things about this being a monthly activity is that the children can really see the differences in the farm from month to month. 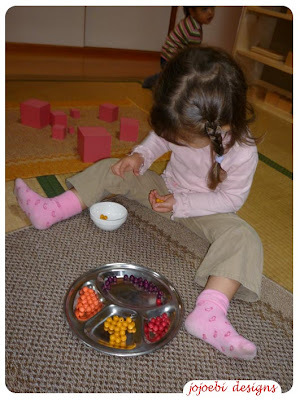 Then we moved to the Montessori house, on the way the boys we shouting and comparing the sizes of their veg, just shows that kids can be interested and excited about veg if they are in the right environment. Yasuyo has set up the room differently this time, her husband Gen made lots of great shelves for the big room and Yasuyo put out a lot more of the equipment, it felt more like a classroom this time and the children had much more room to work in. 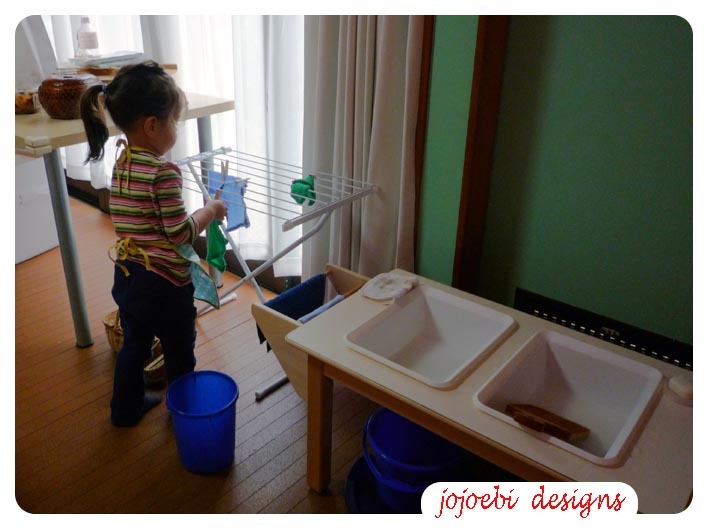 Yasuyo worked with the children in the kitchen room where they prepared their snacks and lunch and did practical life activities and I stayed in the big room. It was a bit intimidating because I don't have all the equipment and so it was the first time I have actually seen some of the things and wasn't sure how to present it all. Here M1-chan is drawing circles, in pink of course! 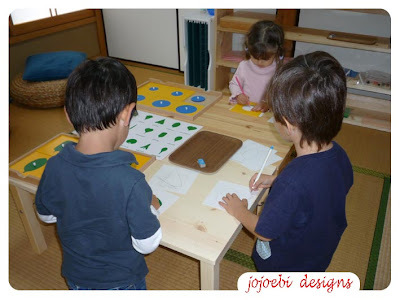 K2-kun and Ebi-kun are tracing leaf shapes, Ebi-kun labelled his and K2-kun used his to make patterns. This is the first time T-kun joined this group but he went to a Montessori kindy so he knows his way around much of the equipment, although he knows the other kids he hasn't spent as much time with them but it didn't long for him to settle in. 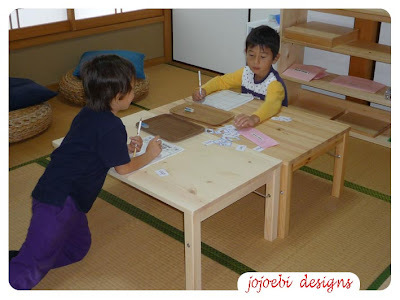 Here T-kun and Ebi-kun and writing words in their bingo sheets, when they finished M2-chan and L-kun were the bingo callers. Whilst all the kids were absorbed in work in my room I took a quick peek into the kitchen, M2-chan was washing and hanging out cloths, I love this little set up. 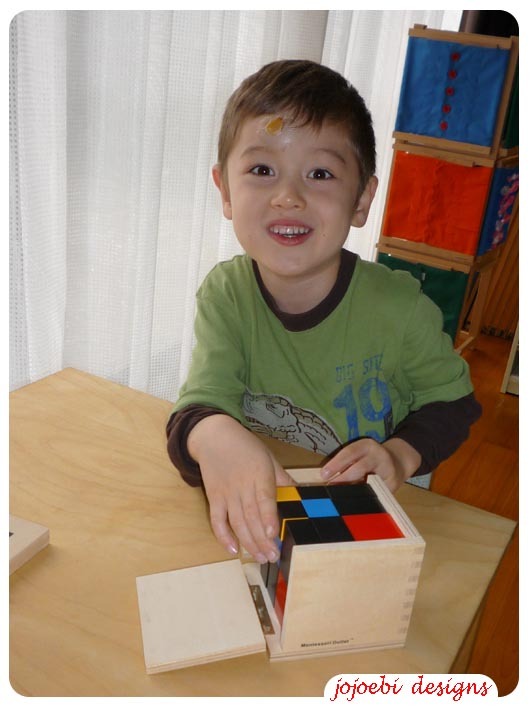 K2-kun looking very pleased with himself for finishing the trinominal cube. M1-chan sorting beads, this was a popular activity with the little ones both M2-chan and L-kun worked with it too. Ebi-kun working on the binomial cube, he hasn't done this for quite a while and it looked like he had forgotten how but he figured it out eventually. 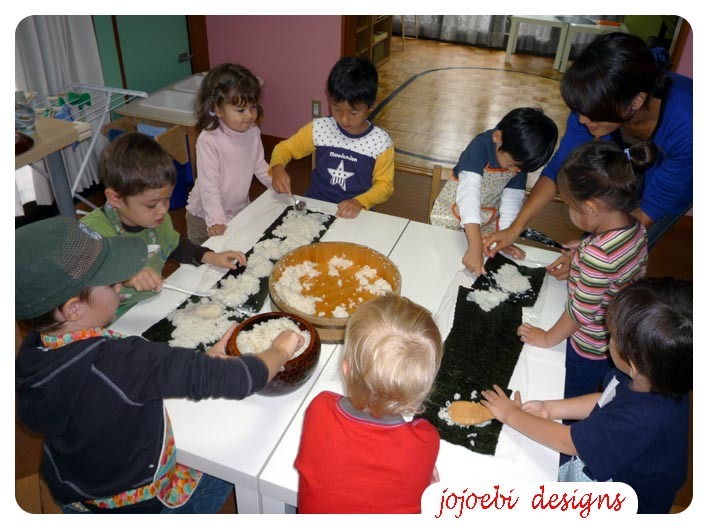 Over the course of the morning the kids had been helping Yasuyo prepare the lunch, when all the ingredients were ready all the kids got together to make giant nori-maki which was fun and then they helped to prepare the room for lunch. By the time they had finished lunch it was obvious that they needed a run about to burn off some of their energy so we cleaned up and headed back to the farm. The boys played tag and then I taught them 'What time is it Mr wolf?' 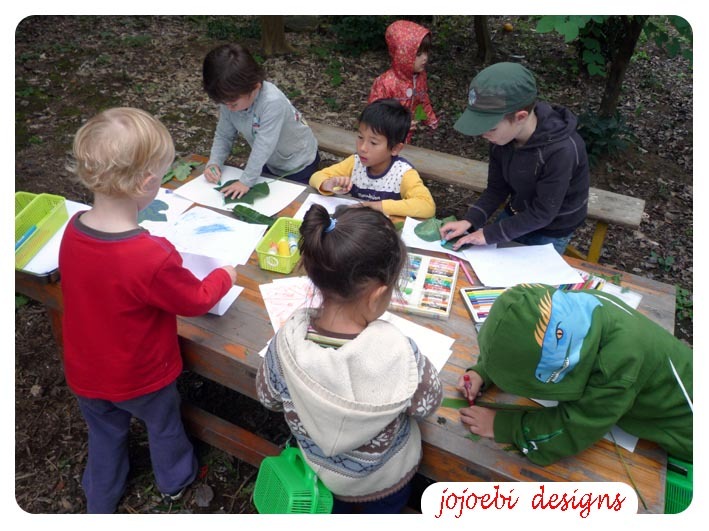 Once they had worn themselves out a bit we asked them to collect some leaves then we went to the art bench. We had planned to do crayon rubbings and print-making with the leaves but the kids had different ideas, some of them coloured on their leaves, some traced around them, L-kun used about half a tub of glue to stick a pile of leaves to his paper. All the time this was going on the kids were chatting in English, it is cute listening to their conversations. K1-kun found a praying mantis skeleton and Ebi-kun found a small lizard so some of the kids drew pictures of them too. T-kun: hmmm but what is dynamite? A-kun: It is this stuff that blows soldiers legs off. I stepped in at this point and asked if they knew what else they use dynamite for and gave them some more uses (other than blowing off peoples legs). All in all it went really well, we need to make a few changes to help make things run more smoothly but it is all part of the learning curve. 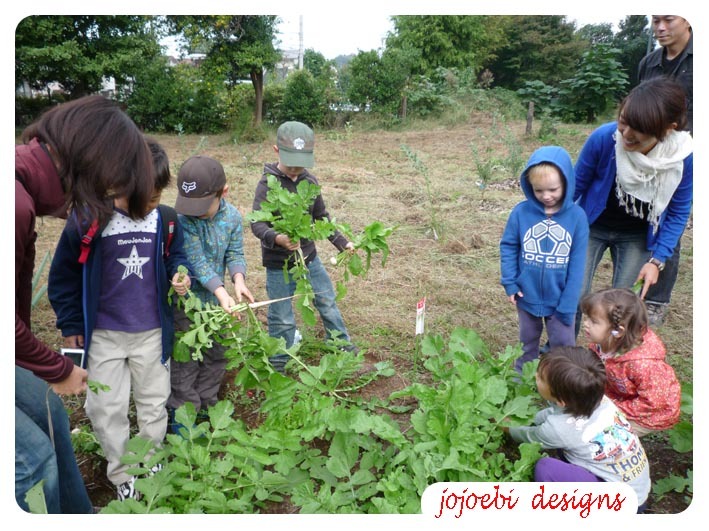 Ebi-kun thanked me and daddy on the way home for taking him, he says that he loves the Montessori Farm and working with his friends. 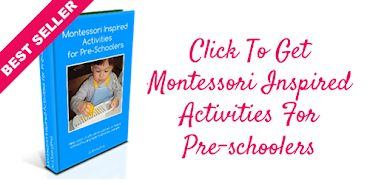 I always love reading,and looking at the photos of what is going on at the Montessori Farm. Nice job everyone is doing! Thank you for sharing. What a great day- like minded people enjoying an enriching environment- and all that fabulous nature to boot! 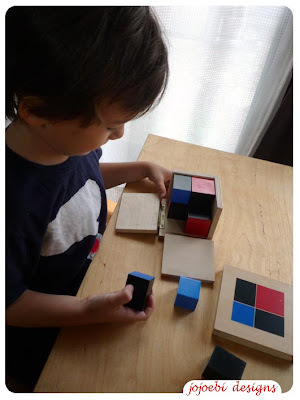 T-kun said it was the best day ever and he wants to come to Montessori farm again. Thank you for posting the photos. I could not join this time and it was nice to get a pick of the lessons and kids chatting.